There are mixed feelings in India about World War II, with soldiers who fought for the British army against fascism not getting due recognition because India was in the throes of struggle against British rule. For historian Bhagwan Josh, it is important to remember lessons from that war, about the horrors of fascism. Military parades recall that anti-fascist message. The Second World War spread not only in Europe, but in vast territories of Asia and Africa where dozens of countries joined the struggle against fascism. Bhagwan Josh, Professor of contemporary history at Jawaharlal Nehru University talked to RIR about India’s attitude to outcomes of that war and explained why Indians do not like to recall this period of their history. Josh knows about the Second World War quite well; not only because he is a historian and has researched it for years, but because of his personal story. “Let me tell you something personal. Two of my uncles were killed in the Second World War. In that sense this war had a personal impact on me. My home village, Bhagsar, is in Punjab, and both my uncles were from there. They joined the British Army for 18 rupees per month. After that, they were trained for a few months and sent to the Eastern Front, to Burma, where they died,” he recalled. The death of his uncles in the war made him feel closer to what Russian families suffered then. “My family is very much like Russian families, where at least one man was killed from each family in that horrible War. In my family two people died at war. When I look at the Second World War, this similarity often comes to my mind. So it is very personal in this sense. You can talk about Second World War on an academic level, but there are not many people who can share such personal feelings. More than 70,000 Punjabi men died in that war. From my village 18 people lost their lives,” Josh said. 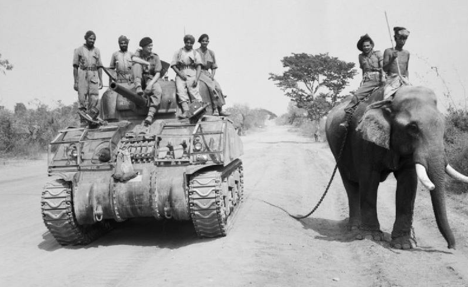 Despite active participation in battles of WWII and the large number of dead Indian soldiers, this war remains a controversial event in Indian history, because India was then a British colony while Indian soldiers had to fight to extend British influence in Indochina. “Only a few books have been written about this war by Indians authors. The Second World War has been largely ignored by academicians and the public despite efforts of the Indian government. Indian soldiers fought bravely, but most Indians are not concerned with this story. The reason is because they fought for the British Empire, and not for Indian freedom,” said Josh. When the war started, the (Indian National) Congress asked the British to clarify the aims of the war. Would the Indian people get their freedom at the end of the war? The British would not make any firm commitment and unleashed massive repression during the war years, especially during the (1942) “QUIT INDIA” movement launched by the Congress. “So now we have no emotional link with those soldiers who fought for Empire during this period. For example, in my village, 18 men died in the war, but in my childhood nobody talked about them. I got to know about them accidentally,” the Professor said. “There was a large mosque in the village. One day it rained very heavily and the mosque collapsed. There was this stone inside with the following written on it: “18 men from this village went to the war and got killed”. I can never forget the shock. Somebody secretly wrote this after the war and kept it hidden there,” said Josh. But there is no doubting the fact that the defeat of Hitler and fascist forces in WWII led to major changes in world history and caused the revival of the Indian struggle for independence. “The War had a great impact on India. The end of the war caused the collapse of the British Empire and brought the freedom of India closer.” With fascist ideas gaining popularity again, the lessons of the Second World War need to be recalled. “There is a revival of fascism in Europe. Look at what is happening in Germany again,” Josh said. “The German Chancellor had to organize a rally against forces sympathizing with fascism. For Germany this is a very difficult situation. Unfortunately, the younger people have no idea what the war had done to the world. They are not taught about fascism and what it did. This happens not only in Germany but in other countries also. Why? Because the kind of atrocities which they inflicted on populations have been forgotten. They are being taught other history. This can cause very dangerous consequences, because young people do not know what happened in the past,” he said. “They do not know what sacrifices were made by the Russian people to save the world. They will be against the Russians just because they are Russians,” said Josh. “I was amazed at the way Germans looked at the Russians as the invaders. They are changing the focus of history,” he said. “You know that historians are the most dangerous people, because they often do a whitewashing of historical crimes. Remember, the present shapes the past to a great extent. New memories are created again and again by the new generations with the help of historians,” said the Indian historian. On May 9 a massive commemorative military parade was held in Moscow, while dozens of smaller ones were held in other Russian cities. According to Josh, such country-wide celebration is necessary, because the world should not forget the lessons of the awful tragedy that happened 70 years ago. “If fascism was not raising its head in Europe as it seems to be doing, I could have said there is no need for military parades in today’s Russia. But the fascists also need to be warned. Russia should send the message to other countries that governments must begin to exercise control over fascist forces. It is not a threat, but it is the message,” he said.